JFK notes that we need desalination to be competitive, and to implement that technology, we need it to be cheap. Currently, many desalination plants around the world are powered by diesel or other fossil fuels, the prices of which are rising rapidly. So how do we get cheaper electricity to power desalination plants? Luckily, coastal areas tend to be some of the windiest areas, which means that wind power can be used to run water desalination plants. A few years ago Edward Spang, a graduate student in Law and Diplomacy from the Fletcher School, wrote his thesis on just that. As Spang points out, using wind to power desalination is a brilliant idea, and one that has a lot of potential. Wind power is becoming cheaper every year as new technologies are developed and more incentives become available. Even better, replacing traditional fuel with wind power has numerous positive impacts for people and the environment. Unlike fossil fuels, wind is non-polluting and does not release greenhouse gases which contribute to global warming. Using wind also means that nations are using a locally available resource, making them more energy independent. Once we have the power source, we have to choose the desalination technology, as there are many available options. One technology which is particularly effective for sea water and requires electrical input is reverse osmosis. 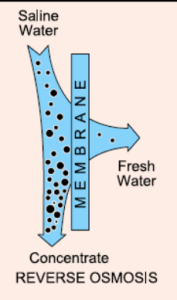 Reverse osmosis uses a selective membrane to separate fresh water from the sea water. It has emerged as a leader among desalination technologies, and it is more cost effective than the alternatives. Cape Verde: Water, water everywhere, but not a drop to drink. But what makes wind so perfect to power these plants? Spang writes that “the intermittent nature of wind energy is uniquely suited for water-based applications (such as desalination and pumping) because the water can be processed and stored in periods of high winds and the water stored in reserve can be used during periods of low winds.” This means that you essentially have a water battery that stores excess power (as water) and saves it for days with no wind, and is more efficient than any actual battery. Wind4Water seeks to do exactly what Spang’s paper recommends, by using wind turbines to power reverse osmosis desalination plants in water scarce countries. Our current focus is on implementing this technology in Santa Cruz, Cape Verde, one of the places that was identified in the paper as having the greatest potential and need for this technology. Cape Verde is a perfect spot because it has all of the necessary characteristics. It is on the coast, has consistently strong winds, and lacks access to fresh water. When this project is complete, it will provide a reliable source of fresh water to the community, which will provide health, economic, and agricultural benefits to the people of the island.